A good peacoat is a staple of a winter wardrobe, and two great places to get one have always been Banana Republic and J Crew. But who makes the better peacoat? 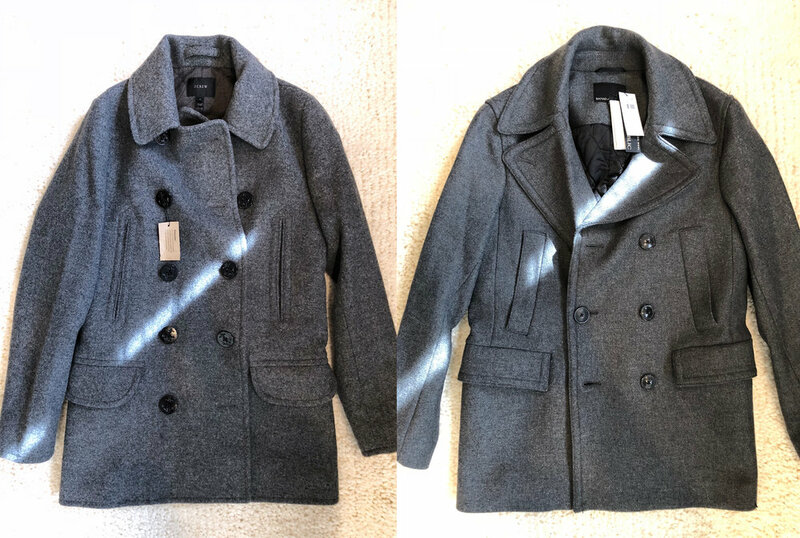 We checked out a grey peacoat from both Banana Republic and J Crew to find out. J Crew: The material of this coat is thick, and rich, and is a beautiful light grey that looks even better in person. The coat is a wool/nylon blend, and it has a thick, textured, scratchy look and feel to it that perfectly suits a peacoat of this kind. I can’t say enough good things about how this coat looks and feels. Plus, it has “Thinsulate” lining, meaning it’s extra warm on top of the fact that the coat itself is a thick wool. There are eight front buttons, as well as an extra one under the collar, and all buttons have the signature peacoat anchor engraving, and feel thick, heavy, and quality. BR: As soon as I took this one out of the bag, I was severely disappointed. The grey color of this 72% wool, 25% nylon, 3% other coat is much darker in person than what was portrayed online, and the fabric was a strange, almost jersey-knit-like weave. The fabric on this thing is almost the total opposite of the rich, textured J Crew wool. It’s got little depth, looks and feels cheap, and has minimal lining to keep you warm (you would think if the material itself was thin that at least the lining would be heavier; you would be wrong). The BR coat has one full set of buttons less than the J Crew coat, and none of the buttons have the signature peacoat anchor design on them. Plus, all the buttons feel lightweight and cheap. I hate to really lay it on here, but I was just severely disappointed with this coat, and how far it strays from what I have come to expect from BR. From top to bottom this coat looks and feels cheap. Both of these coats are similarly styled. Both BR and J Crew offer their peacoat in navy, but the fact that they offered the less common grey is very nice to see, and was the one we tried from both. Liking the lighter grey of the J Crew peacoat over the BR one is a matter of personal preference, but the fact that the J Crew peacoat looks rich and textured while the BR coat looks flat and cheap is not. Both coats have side, slit pockets, which is easier and more comfortable to keep your hands in, and is nice to see on both. The BR peacoat is unreasonably cropped/short (see here) and does not even cover a suit jacket. BR: The reviews on BR’s website this season all complain that BR needs to get back to focusing on fit as this year’s outerwear all fits at least a size too big. Everyone recommended ordering a size down — so much so that BR actually updated the product description for many of their coats telling you to order a size down if you want a slimmer fit. I listened, and ordered an XS. So, how was the fit in real life? God awful. Even after sizing down, the sleeves were sloppy, and the waist was boxy, and yet still somehow pulled oddly at the bottom of my back. Plus, the coat was now far too short, as discussed above. I don’t know what’s going on in BR’s fit department, but they gotta get their act together. This coat is an embarrassment of fit even after sizing down. I can’t imagine how much of a trash bag this thing would have looked like in my normal size S.
J Crew: To be consistent for this review, I ordered a size XS in the J Crew coat as well. (A few reviews even seemed to mention the coat fits a bit long and big, and to perhaps try to size down.) The fit was vastly superior to BR’s. The sleeves were slim as was the waist. There was minimal pulling across the front or back. The length was perfect, totally covering a suit jacket without being too long. However, the sleeves were a bit short, and it actually buttoned to be too tight. But I did size down, somewhat unnecessarily, so it’s not crazy that this thing was a bit too small on me. Still, if I sized up to my usual S, this thing would be too big on me, both in length (and I’m a tall guy! ), and around the sleeves and waist area. In short, I sure as heck was not keeping the BR peacoat, but the J Crew one did not fit me well enough to keep either. I wish J Crew would make their coat a bit slimmer, allowing me to get the size S.
BR: This peacoat retails for $298, though BR constantly runs 40% off, or similar, sales. However, without hesitation, I can say that you should not buy this coat at any price. J Crew: This peacoat retails for the same $298 as BR’s, but is a hugely better bang for your buck than the BR peacoat in every conceivable measure. The material is fantastic both in look and feel, it keeps you super warm, it fits pretty well, and is designed and styled perfectly. If you are a bit less slim than I am, and can fit into your regular size, this is a perfect peacoat. And with J Crew’s regular 25% off sales, it is a fantastic deal and is definitely recommended to be a contender to be your peacoat this season.